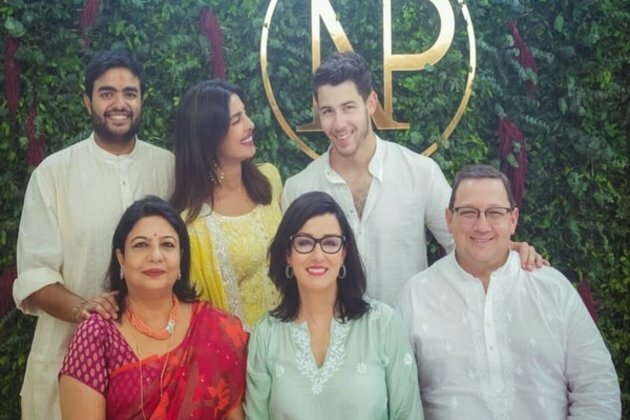 Mumbai (Maharashtra) [India] Aug 19 (ANI): Priyanka and Nick's Roka ceremony garnered immense love from all quarters, but amid heavy downpour of wishes, there was Nick Jonas' father, Paul Kevin Jonas, who welcomed his future daughter-in-law to their family. Expressing his happiness, Nick's father took to Instagram and congratulated the couple as he wrote, "So happy for the engagement of our son @nickjonas and we welcome @priyankachopra into our family with love and excitement." Welcoming the 'Quantico' star to his family, Nick Jonas' elder brother and singer, Joe Jonas, posted an adorable picture of the couple, writing, "I couldn't be happier for my brother. Welcome to the family @priyankachopra We love you." Joe Jonas' fiancee Sophie Turner also welcomed her future sister-in-law with an adorable post on Instagram. She wrote, "Wow. First I'm blessed with an incredible future brother-in-law, and now such a beautiful, inside and out, future sister-in-law. I'm so excited to welcome you into the family @priyankachopra. I love you both @nickjonas." Earlier, Priyanka and Nick were also spotted celebrating Fourth of July (America's Independence Day) with Joe and Sophie.